Stage 0 bladder cancer; drawing shows the bladder, ureter, prostate, and urethra. First inset shows stage 0a (also called noninvasive papillary carcinoma) on the inner lining of the bladder. 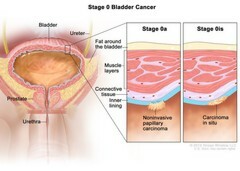 Second inset shows stage 0is (also called carcinoma in situ) on the inner lining of the bladder. Also shown are the layers of connective tissue and muscle tissue of the bladder and the layer of fat around the bladder.